Mattel pioneered the "subscription" model of selling toys, and other companies are starting to follow suit. Of course, Mattel also pioneered the "frustratingly popular character only available to subscribers" model, which we hope won't be picked up as readily. Mattel let fans vote on which "big" character would be the sub exclusive: Shaggy Man, Rocket Red, Black Lantern Swamp Thing, or the eventual winner, Metron. 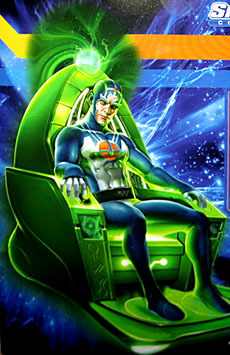 Metron is a New God of mysterious origin who travels through space and time using his Mobius Chair. An ally to no one (good or evil), Metron is an independent thinker, obsessively searching from world to world for greater knowledge. Although he usually prefers not to choose sides, Metron has at one time or another helped Superman and the Justice Society of America save Earth. But he remained his true self as an observer when he discovered a plot to destroy the Fourth World of the New Gods and simply stood back to watch the destruction unfold. Metron's neutrality, like Rustin's common sense, tends to come and go. He was True Neutral at the beginning, doing everything he did for pure scientific reasons. He traded Boom Tube technology to Darkseid in exchange for the X-Element he needed to build his Mobius Chair, but after he saw the devastating atrocities Darkseid used it to perpetrate, he dedicated himself to defeating the evil god. Flip-flopper! Metron uses the slender male body, but gets new hands and head. The hands are open and gesturing, with sleeves hanging down over his gloves, and all those light blue lines on the head? They're all sculpted! This is a case where painting them on would have been perfectly acceptable, but credit where credit's due, Mattel actually did more than they needed to. You do have to ask, though: why, if the lines on his cowl are raised elements of his costume, why aren't the lines on the rest of his suit done the same? Not from a toy-making persepctive, because the answer is "to save money," but in-universe. Give us a kayfabe reason why he'd make part of his costume 3D, and the rest 2D. The intricate paint on his torso is flawless, which is nice to see, but it still doesn't jibe with what's above his neck. 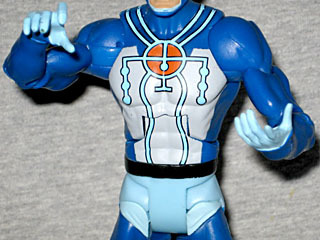 Oh, and speaking of, my Metron has several scratches on his face. This is unlikely to be a problem with all the figures, and it's easy enough to fix, but it's still very disappointing to see this on an expensive exclusive figure. It's not like you can run down to the store and buy a replacement Metron, you know? Fortunately, nothing important is wrong with him. He has the usual DCU Classics articulation, and none of the joints were stuck at all. A few paint problems is one thing, an arm or leg that snaps off is quite another. The up-down motion of the head is a little bit loose, but the side-to-side is nice and tight. Besides, it's not like he's going to be doing anything really dynamic anyway: like the rest of us, he just spends most of his time sitting in his chair. Metron is sold offered as a deluxe oversized figure, and since the man himself is no bigger than usual, the rest of his package is taken up by his "some assembly required" Mobius Chair. It's 8⅝" tall, 7¼" long and 4⅝" at its widest point, and he looks pretty good seated in it. The chair and the platform it rests on are two pieces, and when you put them together, they're not coming apart again. Be sure you tuck the rear "legs" into their notches before snapping the pieces together, or you'll be sorry. Believe us. The chair has a nice level of detail. 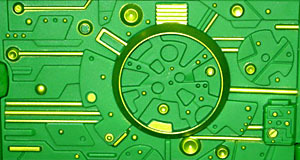 Most of the surfaces are smooth, or have only a few large sculptural details on them, but there are keypads right below where the user's hands would rest and some deeper detailing on the foot rest, but the really crazy Kirby tech can be found on the underside and in the exhaust port on the back. I may not be much of a fan of Jack Kirby's art style, but there's no denying that it's completely distinct, and this sculpt replicates it very well. Mike Thompson's portrait on the back of the box interprets the disc not as a solid object, but as a twisted knot of the very fabric of the universe. This isn't something you could touch and feel, it's time and space literally warping around his chair - how awesome is that! The design of the chair in the artwork isn't the same as the design of the chair as a toy, but that's okay; surely mere mortal minds like ours would have trouble comprehending a device as fantastical as the Mobius Chair, so some variation in form is to be expected. It's green, it has tech on it, it glows, a man sits in it... it's close enough. And the Metron sitting in it is no slouch, either. [So he has good posture? --ed.] To signify that this figure is special, the Signature Collection logo on the front is done in a special foil application. 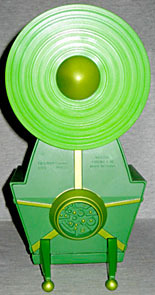 When Jack Kirby created Metron, he based the character's personality on Star Trek's Spock. And later (as Poe detailed), Metron was the inspiration for MotU's Zodac. 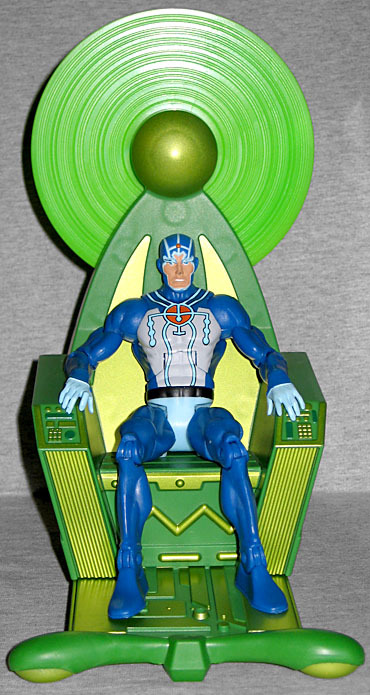 The popular (fan) opinion is that if it weren't for the figure subscription plan, Metron would have been this year's SDCC exclusive, possibly with lights and sounds in his chair. We can't say whether that's true or not, and it honestly doesn't matter: the figure's out now, and this is how it happened. 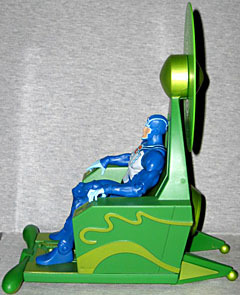 Paint issues aside, Metron's pretty cool, and the chair is more of a set piece than an accessory.